We offer many choices in materials, colors, and prices. For instance, we have budget-friendly options, such as laminate or solid surface countertops. If you want high-end products, we also carry elegant stone countertops made of quartz, marble, or granite. Whatever material you prefer, make sure you ask us about our comprehensive installation services.Get creative in the kitchen by sprucing it up with new countertops! You and your family spend plenty of time in the kitchen – preparing meals, cleaning dishes, and just hanging out together. So it makes good sense to add appeal and convenience with new kitchen countertops. Come to our locally owned countertop store to make your selection. Quartz countertops combine easy care with beauty and strength. Made of from 94% quartz, these countertops are enhanced by the manufacturing process. Other ingredients that make up your quartz counters include pigments for a variety of colors and resin, which makes these counters attractive and nonporous, as well as scratch and stain-resistant. We carry brand names from leading manufacturers, such as Cambria™. This manufacturer creates natural stone countertops that are both elegant and durable. Our professional designers consider marble countertops the Cadillac of kitchen counters. Unique to marble is the veining that runs through each slab. This alone is enough to make your countertops the focal point of your kitchen. Marble is soft and easy to work with and lends itself to custom shapes and edges. Add classy appeal to your kitchen with stone countertops. One of the most in demand is granite. This natural stone is worth its weight in appeal, value, and strength. Heat-resistant, granite is easy to clean, as well as sanitary. Bacteria do not accumulate on the dense surfaces of granite countertops. Hygienic and highly durable, granite is an excellent choice for many homeowners. It is remarkably easy to keep your solid surface countertops clean. As the name says, solid surfaces are comprised non-porous materials. Bacteria and germs have no place to hide on these countertops. In addition, your decorating options are endless because solid surfaces mimic stone and offer patterns and colors not found in nature. When you are shopping for kitchen counters on a budget, choose laminate countertops. These affordable countertops are made to look like high-end surfaces of natural stone but are budget friendly. Laminate resists heat and stains and is available in countless styles, colors, and patterns. Along with our guaranteed flooring installation services, our company provides professional countertop installation. It is more convenient to have our countertop technicians do the installation for you. Our rates are affordable and our service is exceptional. We have the experience, tools, and equipment to install your countertops so you can enjoy your countertops for many years to come. 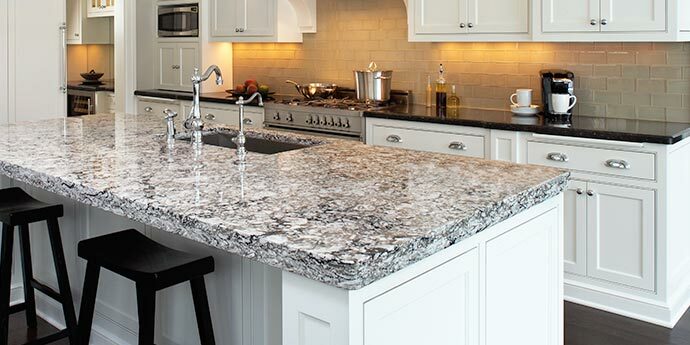 Contact us today to learn more about our wide array of kitchen countertops. We proudly serve the communities of Fort Dodge, Webster City, Humboldt, Eagle Grove, and Clarion, Iowa, as well as the surrounding areas.